If you’ve never made ricotta at home, please try this ridiculously simple recipe, and be warned that you will lament not making this earlier, just like I did. Where have I been? I could have been having this superior, fresh ricotta instead of mediocre store-bought versions all along. I mean, we don’t all live in Brooklyn with access to Salvatore Bklyn’s ricotta (do you remember me raving about it a couple of years ago?) so we have to head to the kitchen ourselves for anything nearly as good. Of course you could use it in any of your recipes for stuffed pasta, lasagna, or to lighten a quiche, add creaminess to a soup, etc. But for me, something this good needs to be eaten as straight up as possible. First, well, I ate some with a spoon. 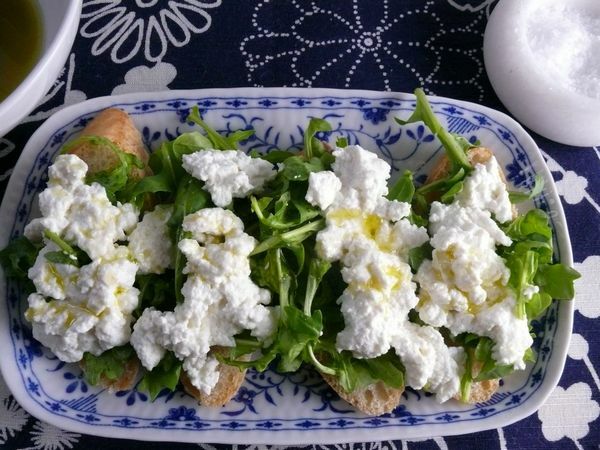 Then I topped baguette slices with wild arugula, spooned some clouds of ricotta onto them, drizzled very good olive oil on top and sprinkled crushed Maldon salt (my favourite way.) 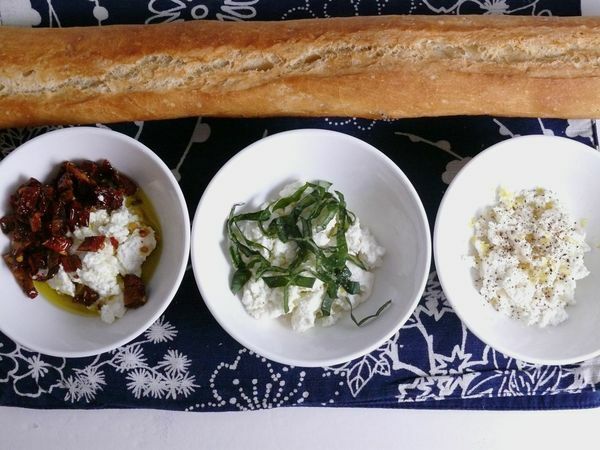 I had friends coming over so I stopped eating every last bit of the ricotta, and distracted myself with making three flavour combos for the rest: chopped sun-dried tomatoes in oil, fresh basil ribbons and grated lemon zest with freshly ground black pepper, all topped with more crushed salt. Everyone had a different favourite, but everyone also agreed the toppings were not that relevant. There was delicious, milky, soft, fluffy, fresh ricotta. The rest, just details. Combine milk and buttermilk in a large, heavy-bottomed (less likely to burn) pot. Add the thermometer to the pot (if using) and set the pot over medium heat. Stir occasionally with a wooden spoon or rubber spatula, scraping the bottom to make sure the milk isn’t burning and to heat the liquid more evenly. Meanwhile, set a colander over a large bowl and line the colander with 5 layers of cheesecloth, making sure you have ample overhang all around. When the milk heats up and starts to steam, continue to stir and scrape the bottom, but gently (I stopped once I was approaching the ideal temperature so that so that the curds would stay as large and fluffy as possible.) Once the thermometer hits about 170-175 degrees, curds will begin to form and float to the top of the milk. Skim them from the top with your skimmer or ladle and transfer them to the cheesecloth. Scrape the bottom on the pan to free any stuck curds. 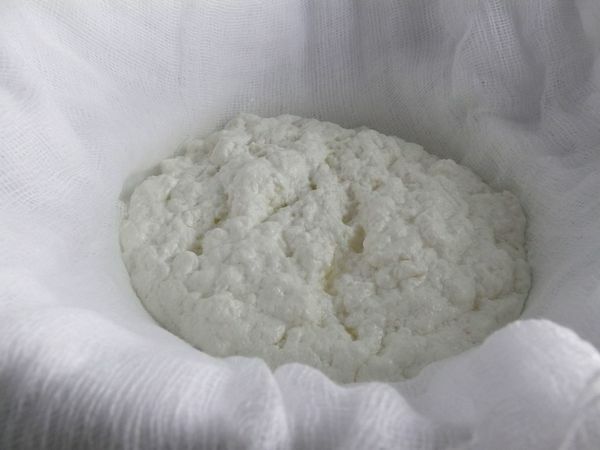 Let the ricotta sit for 15 minutes, then lift the cheese cloth and let any excess liquid drain off–do not squeeze unless you want a firm ricotta. Transfer to a serving plate and eat immediately, or refrigerate in an air-tight container for no more than a few days. The whey left behind is actually what is normally used to make ricotta, and can be used immediately to make a second batch–though I have not tested that yet. When I do, I will update this post with those instructions and notes. Oh, and by the way, there’s no reason you can’t reuse all that cheesecloth if you wash it really well in hot, soapy water and hang it to dry. The weave may be looser in the middle but doubled up, it is still useful. Next Articlenew to the NEW le sauce? Making ricotta is one of my most favourite discoveries of the past few months. a.) cheaper than store bought. b.) easy! c.) so much more delicious! it really is SO much better! have you also made it from the whey? I discovered homemade ricotta last year. It is so very easy. Thanks for the tip to use the leftover whey for another batch. This recipe looks so very similar to those for cottage cheese. The cheese I make uses milk that is allowed to sour. So, my question is, “What is the difference between ricotta and cottage cheese?